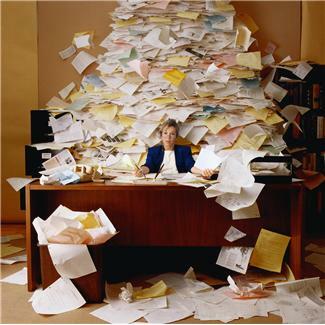 Years ago I worked with a woman whose desk was always in disarray. Papers would be strewn everywhere, Post-It notes were stuck everywhere, and there’d always be an empty paper coffee cup or mug with the tea bag still inside clogging up her workspace. I don’t know how she got anything done! When a supervisor came in, he or she would take one look at that desk and shake their head, disapproval written on their face. I know some people have no problem dealing with a little chaos, but a clean and tidy desk is the best way to demonstrate a professional attitude. It may be mildly entertaining to watch hoarders on TV, but nobody wants to share a cubicle with one. And even if you think that your boss spends all of his or her time holed up in their office and couldn’t pick your desk out of a police line-up, you’d be surprised at how much negative attention a disorganized workspace can get. Trust me, people notice! -Limit your amount of personal items. Photos and knickknacks add color and personality, but they can take up a lot of space and also run the risk of being too kitschy or intimate. I suggest limiting yourself to one or two snapshots (nothing showing you out partying or acting inappropriately). Museum gift shops are great for finding beautiful postcards and calendars which are a bit more tasteful than your typical cubicle gear. Lastly, only add a plant if it’s low-maintenance and you’re committed to taking good care of it. A dead houseplant on your desk sends a bad message! -File it away. I find that the easiest way to keep my paperwork under control is to buy a pack of stylish file folders and break everything down into small categories—pending projects, urgent attention, etc. Splurging on colorful drawer dividers and other office supplies also makes me more inspired to keep everything nice and neat. -Have a cleanout. Do you really need a dozen packets of ketchup in your desk drawer, or all those old receipts? At the end of the workday, take a minute to toss out junk that has accumulated. If you’re the type who, yes, does need a supply of ketchup on hand at all times, at least stash the packets in a slim pencil case where they will go unnoticed. -Don’t forget to dust. Computers and desks constantly collect dust, and keyboards get filthy over time. I make it a habit to swipe down my work surface throughout the week so that it’s clean. I feel like a clean desk makes me more productive, don’t you?